Each year’s programming at the Windy City Pulp and Paper Convention includes a pulp-related Film Festival sponsored by Murania Press. Below are our program notes for the 2019 lineup. Due to their length, we’re giving you just the Friday selection in this post; blurbs covering Saturday’s films will follow immediately in a second post. Windy City’s Film Festival is almost as old as the convention itself: 2019 is our 18th year of screening motion pictures and TV episodes—many of them quite obscure—adapted from stories originally published in pulp magazines. This year, as always, we’ve managed to scrounge up a number of rarities you’re likely to be unfamiliar with, so when the dealer-room action becomes overwhelming and you need a break, by all means mosey on over to our “theater” and relax with one or more of these little gems. 12:00 p.m. — THE NERVOUS WRECK (1923), 74 minutes. Adapted from “The Wreck” (Argosy All-Story Weekly, December 3, 1921-January 7, 1922) by E. J. Rath [Edith Rathbone Brainerd]. Pulp devotees often forget that the top all-fiction magazines originally appealed to general audiences before shifting to an action-adventure orientation. The early Munsey pulps, today remembered primarily for their “scientific romances,” cast a wide editorial net and, among other things, ran lightly humorous stories mostly aimed at female readers. E. J. Rath (real name: Edith Brainerd) was a master of such easily digestible confections and placed dozens of them with The Argosy, The All-Story, The Scrap Book, The Cavalier, and Munsey’s Magazine between 1906 and her untimely passing in 1922 at the age of 37. Her final yarn was “The Wreck,” serialized in late 1921 by Argosy All-Story Weekly. Subsequently licensed for the stage, it was adapted by prolific playwright Owen Davis as The Nervous Wreck and enjoyed a Broadway run that lasted nearly the entire 1923-24 season. Hollywood producer Al Christie, who rivaled Mack Sennett and Hal Roach in the mass production of comedy short subjects, purchased movie rights to the play and brought it to the screen in 1926 with Harrison Ford—a light comedian whose film career was on the wane—as Henry Williams, a dithering Pittsburgh hypochondriac who believes himself afflicted with a dread disease and goes to Arizona in search of a cure. In the desert wilds he undergoes a series of misadventures that lead to robbery, elopement, and pursuit by the local sheriff. Adapted by F. McGrew Willis and directed by Scott Sidney, The Nervous Wreck does quite well by Rath’s original, adroitly blending character comedy with broad slapstick for a bubbly cinematic concoction. Incidentally, the property’s life was extended when theatrical impresario Flo Ziegfeld bought the Owen Davis adaptation and reworked it into a stage musical titled Whoopee! Starring Eddie Cantor, the lavishly mounted production logged more than 400 performances in its 1928-29 engagement before being licensed by Samuel Goldwyn, whose 1930 Technicolor film version featured Cantor and other members of the Broadway cast. A huge success, it’s still considered a classic and is one of the oddest motion pictures to boast a pulp-magazine story as the basis of its plot. 1:30 p.m. — THE MISSING MILLION (1942), 78 minutes. Adapted from “The Missing Million” (The Popular Magazine, June 20-August 20, 1923) by Edgar Wallace. The filming of crime novels by Edgar Wallace was practically a cottage industry in England, with dozens of his yarns brought to the screen there over a 40-year period. Wallace adaptations occasionally could be expensive, star-studded affairs, but more often than not they were economical little potboilers with middling casts—U.K. equivalents of Hollywood “B” movies. The Missing Million, turned out under stringent wartime restrictions, definitely belongs to the latter group. When young millionaire Rex Walton (Ivan Brandt) disappears after receiving a blackmail threat, his sister Joan (Linden Travers) enlists the aid of Scotland Yard Inspector Dicker (John Stuart) to find him. The trail is strewn with corpses—members of an underworld gang who have tried to double-cross their mysterious boss, known as The Panda. Walton had drawn a million pounds from his bank account before vanishing, which lends urgency to Dicker’s search. And there’s another complication: Rex’s fiancée Dora (Patricia Hilliard) is a member of The Panda’s organization. Some of Britain’s Wallace adaptations received theatrical distribution stateside, but The Missing Million wasn’t one of them. And until its recent release on DVD in the U.K., this film was all but forgotten in its country of origin. Not as snappy as The Flying Squad, which we screened here last year, it certainly has the flavor of a typical Wallace crime story. Anyone familiar with actors who regularly appeared in English-made movie melodramas will guess The Panda’s identity early on, although possessing that knowledge won’t be an impediment to enjoying the show. 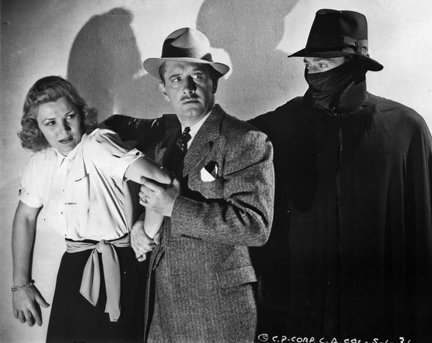 3:00 p.m. — THE SHADOW (1940), Chapters One through Seven, app. 150 minutes. Partially adapted from the Shadow Magazine novels “The Green Hoods” (August 15, 1938), “Silver Skull” (January 1, 1939), “The Lone Tiger” (February 15, 1939), and the Shadow radio episode “Prelude to Terror” (January 29, 1939). Although we would have sworn The Shadow was run in its entirety at a previous Windy City convention, a review of past Film Festival schedules reveals that in the past 18 years we’ve shown only a few odd chapters as representative samples. As it’s one of the few chapter plays adapted from a hero pulp, we figured there’s no time like the present to give this fast-paced romp a complete screening, which is being done in two lengthy sessions. An audacious if not entirely successful fusion of the character’s pulp and radio incarnations, The Shadow boasts a substantially original screenplay that incorporates elements from three of Walter B. Gibson’s novels and a 1939 radio broadcast. Veteran character actor Victor Jory, coming off widely praised “heavy” portrayals in Dodge City and Gone With the Wind, was cast in the title role based primarily on his superficial resemblance to the Lamont Cranston depicted in the Street & Smith magazine, and secondarily for his sublimely creepy rendition of The Shadow’s sepulchral laugh. The industrial life of a major city is threatened by a criminal mastermind known only as the Black Tiger, who attacks prominent industries and the men controlling them. At wit’s end, Police Commissioner Ralph Weston (Frank LaRue) and his ace investigator Joe Cardona (Edward Peil) enlist the aid of criminologist Lamont Cranston (Jory) to help them run the Tiger and his gang to earth. Unbeknownst to them, Cranston is also The Shadow, a mystery man whom the police believe is just as crooked as the malefactors he brings to justice. His loyal assistants include Margot Lane (Veda Ann Borg) and Harry Vincent (Joseph Young, a.k.a. Roger Moore). The first Columbia serial entrusted to independent producer Larry Darmour, who for several years supplied the studio with chapter plays made on shoestring budgets to maximize profits, The Shadow was directed by James W. Horne, whose film career dated back to the nickelodeon days. His ten episodic thrillers for Darmour teem with lowbrow humor (mostly targeting the heavies) and florid overacting but are invariably entertaining, The Shadow ranking as best of the lot. Immediately following Friday auction — TEXAS TRAIL (1937), 58 minutes. Adapted from “Tex Ewalt” (Short Stories, January 25-February 10, 1922) by Clarence E. Mulford. We continue our string of Hopalong Cassidy films with one of the very best series entries (and there were 66 of ’em), which demonstrates just how good a simply plotted “B”-grade horse opera could be when dressed up with picturesque locations, evocative musical scoring, and an extremely personable cast. Texas Trail, like many Hoppys, is not surfeited with action sequences, saving most of the hard riding and fast shooting for its suspenseful climax. But director David Selman dresses up the narrative with nice little scenes of character development, especially between series star William Boyd and 12-year-old rodeo star Billy King, making the second of his four appearances in a Cassidy film. The Spanish-American War is underway and the Bar 20 hands are training for what they hope will be deployment with Teddy Roosevelt’s Rough Riders. The Cavalry, however, has other plans for Cassidy and his men: It urgently needs replacement mounts and assigns Hoppy to round up a herd of wild mustangs in the remote Ghost Canyon district. 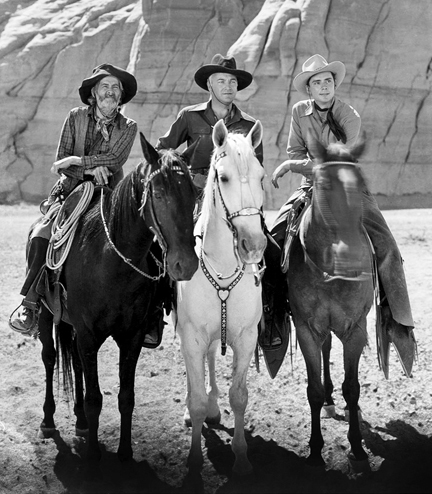 With loyal pals Lucky (Russell Hayden) and Windy (George Hayes) at his side, he leads the Bar 20 outfit on what promises to be an arduous trek. Unscrupulous renegade Black Jack Carson and his gang follow surreptitiously, planning to rustle the captured horses and sell them to the Cavalry at exorbitant prices. Officially (in publicity material and screen credits), Texas Trail is identified as an adaptation of “Tex Ewalt,” serialized in the Doubleday pulp Short Stories and published by the company in a hardcover edition titled Tex. Actually, the film uses nothing from its ostensible source material. One could accuse us of duplicity in labeling it a legitimate pulp-story adaptation. Well, okay, guilty as charged. But Texas Trail is so darned entertaining that we’re willing to wager you won’t mind a bit once you’ve seen it.